Today I am using French Ultramarine Blue and a bit of Ultramarine Violet to create the deep shadow underpainting for the background. I just applied very wet paint in varying values to create the foundation for the deep colors I want. 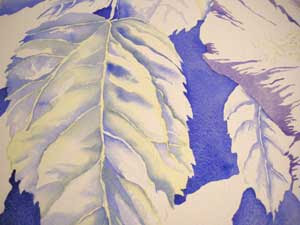 I am also using the French Ultramarine Blue to develop some of the initial details and shading in leaves. The subtle areas of light and dark with crisp and soft edges replicate what I see in the reference photos. 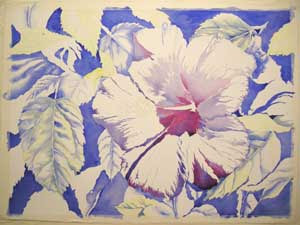 I am not painting exactly what I see, but I am searching to create the "look" of the texture of the leaves. To develop these areas I apply a stroke of fairly strong color, very wet with a number six round brush. Then, quickly clean my brush, tamp it on my toweling next to my palette and touch the wet pigment on one side with the damp brush. This softens the edge. Then I dip the brush in clean water, drain a little off on the towel or the edge of my water container so that the brush is not dripping. I use this liquid, starting in the clear, dry, paint-free area, and pull the water into the pigment. This softens the edge, draws the pigment out a little, but the outer edge is only clear water, so it will dry without a line. 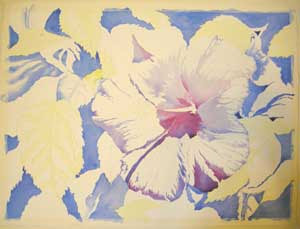 You can see the effect of the yellow underpainting on the leaves. It took several hours to work around the painting in this manner.